Amritsar: The ruling Congress party and opposition Shiromani Akali Dal (Badal) have indulged into blame game over advertisements near the Darbar Sahib in Amritsar. 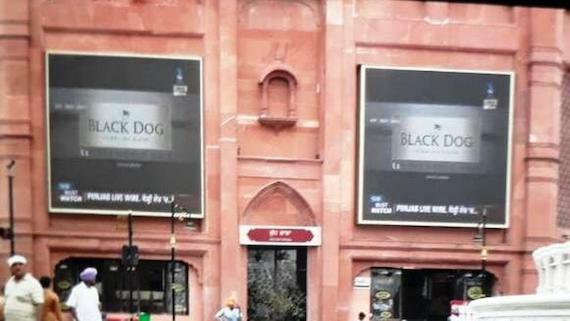 The SGPC had raised objected to display of liquor ads on LED screens places on a street leading to the Darbar Sahib complex. In response to it, the Congress party issued a press release on Sunday (June 11) evening in which Congress party’s state chief Sunil Jakhar maintained that the ads were a legacy of previous Punjab government led by Shiromani Akali Dal (Badal). He asked that when the contract for ads was entered into by Badal government for 15 years, why the Congress party’s government was being blamed for it? It was followed by a written press release by the Shiromani Akali Dal (Badal) hitting back at the Congress. SAD (Badal) Secretary and Spokesman Dr. Daljit Singh Cheema said that instead of blaming the previous government, the Congress Chief should have asked this question to the present government that why the violation of advertisement contract has taken place now? He maintained that if their government did not have follow the proper agreement conditions, then similar advertisements would have been telecast on these LEDs during previous regime also. He asked the Congress Chief that if he can quote a single instance when such highly objectionable advertisements of liquor were telecast in the SAD-BJP times.